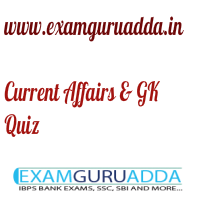 Dear Readers Examguruadda.in presents Current Affairs Quiz Questions and Answers of 3-4 March 2017 that cover important current affair events. Current Affairs quiz for IBPS PO,clerk, RRB-Po,Clerk, SBI, NIACL,Railways and SSC Exams. 1. Who has won the 2017 Polly Umrigar Award for International Cricketer of the Year? 2. Yumnam Yaima Singh, who passed away recently, was related to which field? 3. Who is the newly appointed Chairman and Managing Director (CMD) of Mahanagar Telephone Nigam Limited (MTNL)? 4. Who is the author of the book “Mr and Mrs Jinnah: The Marriage that Shook India”? 5. The Permanent Indus Commission (PIC) meeting will held in which city? 6. Which country to host the 2017 Indian Ocean Rim Association (IORA) summit? 7. Which country to build its’ first national under water observatory in disputed South China Sea? 8. Who is the author of the book “When Crime Pays – Money and Muscle in Indian Politics”? 9. Raymond Kopa, the football legend has recently passed away. He hails from which country? 10. Which Indian grandmaster has won bronze at 2017 Women’s World Chess Championship?